On October 16, compassionate people around the world come together to stand up for policies that protect the cats in their communities. 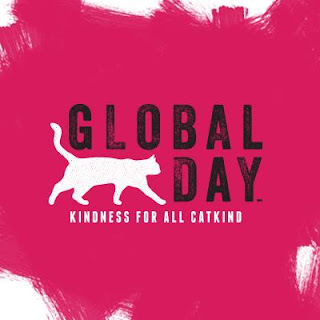 Join Sandpiper Cat Blog and Alley Cat Allies for their Global Cat Day campaign. 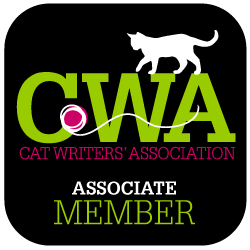 Take a pledge, your support helps us better advocate for cats who call the outdoors their home! FACT: Local animal control laws often don't consider that the only safe home for a community cat is the outdoors. 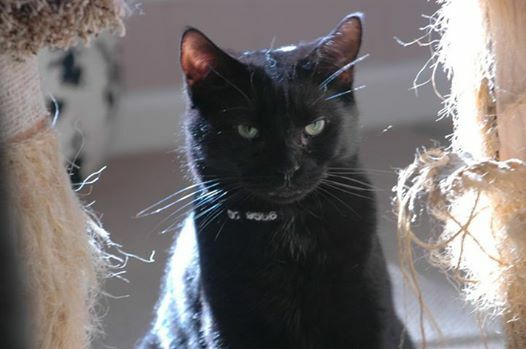 Inf act, many ordinances go as far as fining those generous caregivers who know all too well that community cats aren't socialized to humans and would be considered unadoptable in a shelter. Together, we can change local laws that punish kind-hearted cat lovers who help community cats. FACT: Trap-Neuter-Return (TNR) is the gold standard of cat population control. It's the only humane and effective method proven to stabilize and reduce cat populations. Under TNR, cats living outside are humanely trapped, spayed or neutered, ear tipped, and then returned to their outdoor home. FACT: So far, over 650 municipalities have implemented TNR ordinances and policies. Over the past fifteen years, the number has increased tenfold, and that number continues to increase. It's thanks to the advocacy of people like you that communities are embracing the humane, effective approach to community cats. I have recently moved to Cape May, New Jersey, and they have two programs for TNR. One being the New Jersey Trap Neuter Return Project. The other program is Animal Alliance of Cape May County, which offers low-cost spay and neuter programs. Read last year's post 2016, as well as other past years - 2015, 2014, 2013, 2012, 2011. Having a cat that wears a collar and ID tag can be the difference between a lost cat being returned home, or being mistaken as an outdoor cat that never returns home. Sandpiper Cat Blog always has been and always will be an advocate to have cats that wear collars with ID tags. Regardless of whether your cat goes outside or is strictly an indoor cat, it just makes sense to be on the safe side. The reason my cats wear collars (and live strictly indoors) has to do with my dad's past cats. They were all outdoor cats (not uncommon at the time), who in the end went missing never to be seen again, or got run over by a car. Of course you can't stop the ladder other than keeping your cat inside, but the former might be preventable by having your cat wear an ID tag. All of our cats (with one exception) wear collars and ID tags with their names, a phone number and say "I'm lost if outside." My cousin Madeleine came up with the lost if outside line, which was a fairly recent addition to our cat's ID tags. Henry is our one exception to wearing a collar and tag. I've often judged people who say, "My cat hates wearing collars and we can't force him to wear one." Well, in a do as I say not as I do situation, Henry refuses to wear a collar - he physically takes the collar off and has choked himself in the process. He grew up wearing a collar with a tag - which maybe was too dangly for him as a kitten at the time, and he always acts as if he is wearing a collar with tag and he tries to go after it (even after years of not wearing a collar). Henry in 2010, wearing a collar. We had embroidered collars with no tags for him. Henry was very sick a few years ago and would take his collar off every night. Eventually we stopped fighting him to put it back on him, especially after he lost over half his body weight and was essentially at death's door. Henry is microchipped, and the world's friendliest cat, so he is the one exception to our collar/ID tag policy (to my chagrin). Our other cats don't mind their collars, and it has always been fun to pick out collars to match their personalities. Piper's new collar. While it comes with an adorable strawberry bell, with 8 cats we don't like them wearing bells. Just imagine 8 cats all jingling! I saved it to use for a craft project. 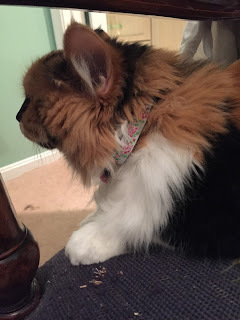 When the brand Cool Cat Collars asked me to write a review of one of their collars, I was excited to pick out a fun new collar for Piper. CCC has quite a wide array of collars to choose from. From velvet collars, mustaches, glitter, real leather to various super heroes/heroines, there is something for every cat! Their website even states: As you no doubt are already aware, the most important reason for getting a cat collar is safety. 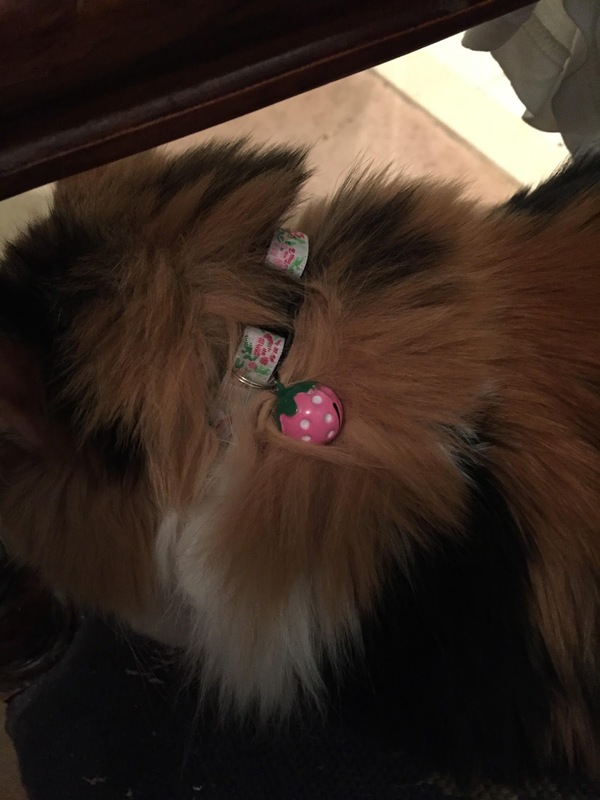 It is much easier to retrieve a cat should they go astray if they are wearing a personalized cat collar. A neat thing about CCC, is that they only make saftey collars, that are fit with a buckle that will break away if it gets snagged on anything. Your cat collar can match your cats personality while keeping them stylish and safe. 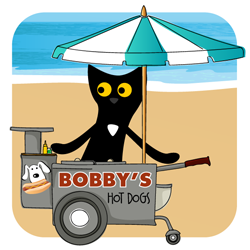 Cool Cat Collars also sells toys, ID tags, harnesses, and bells and charms. 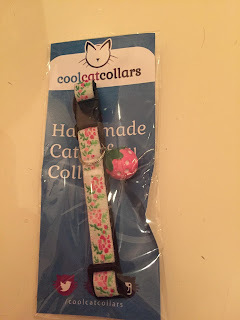 Cool Cat Collars is based in the U.K., and they ship wordwide. Find Cool Cat Collars on Facebook, Twitter and Instagram. Sandpiper Cat Blog received a complimentary collar to review. Sandpiper Cat was not compensated for the review. 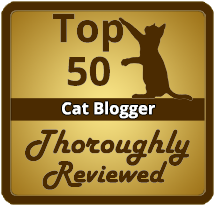 6th Anniversary of Sandpiper Cat Blog! And an update. It's hard to believe that it has been six years since Piper came into my life on March 13, 2011. I feel like everyone says that about their pet's "gotcha day," but I think it is pretty different for us. Piper came to us half way through her pregnancy and she ultimately miscarried her kittens that night. She was really only a kitten herself, about 7 months old. And I was 18 years old. Piper had a busy summer watching the Olympics. She was a big fan of Katie Ledecky, Michael Phelps, Nathan Adrian and Anthony Erwin. She even tried to knock over Usain Bolt! She and I are in such different places now. Piper is now about 6.5 years old and I'm 23. I was a senior in high school when we rescued Piper and now I am a college graduate and working in New Jersey. Yes, that's right - I don't even live with Piper right now! Which is really hard and sad for a lot of reasons because I have never been without a cat (with the exception of vacations). I miss her a lot and I get to FaceTime with her. I'll see her again in a few weeks when I go home for some dental work. But it is difficult not to live with any cats. Piper did have some health issues in November and December 2016. In November she went in for her regular dental cleaning and they found a heart murmur. They took her back to the cardiologist and she was cleared to have her dental surgery, but she peed herself. She had a urinary tract infection and could not safely have her dental. 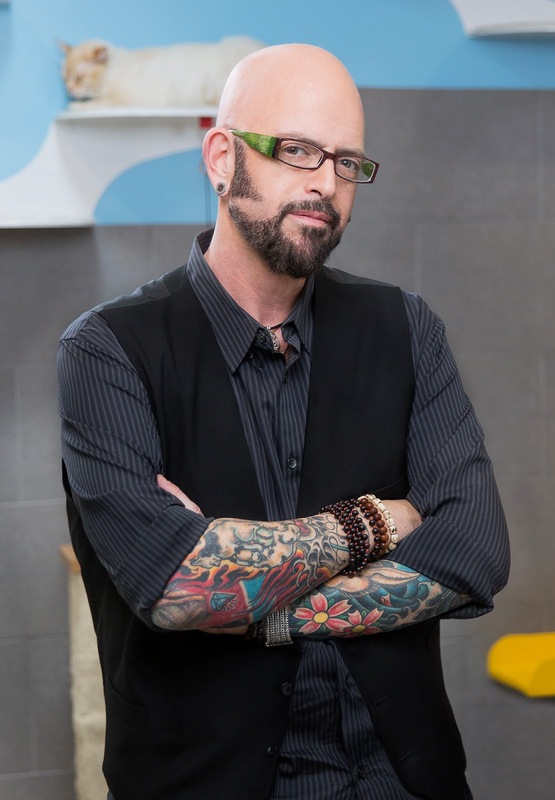 A few days after the weird blood episode. We took her home with pain medication and antibiotics, to get her healthy again. Maybe a week or so later, we had a very scary incident. I came home from shopping and saw blood all over the kitchen. I'll spare you any more details (and definitely no pictures), but as soon as I saw her bloody paws, I knew something was terribly wrong. 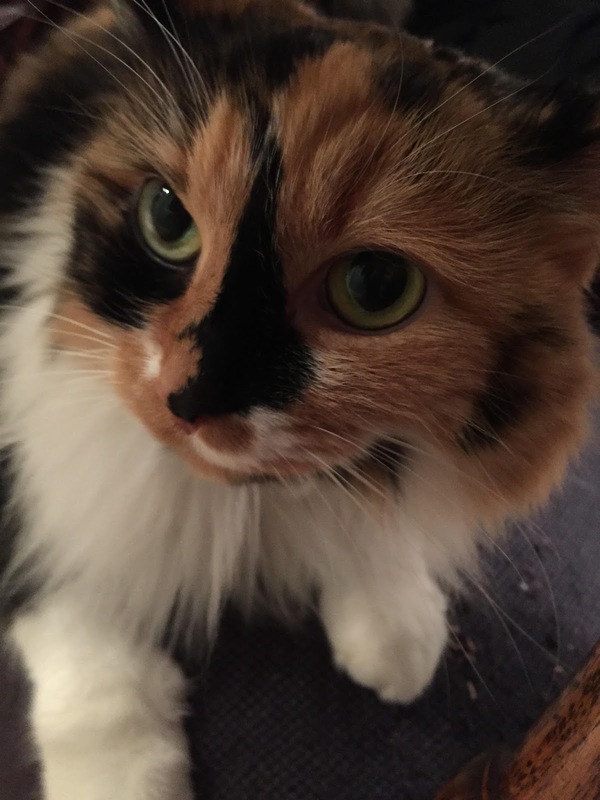 My dad and I checked the other cats and decided it had to be Piper since she had blood matted in her fur. We scooped her up and rushed off to our closest emergency vet. They took her back right away to examine her. And to our surprise, they came back out and said they could not find any possible wounds or anything external - and could we bring back our other cats to see if it was one of them? 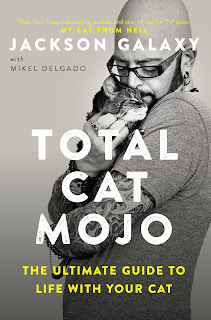 Now that's all good when you have maybe two or three cats. But when you have 8 cats total...not so much. Plus we have a few who we have trouble even catching to go to the vet for their regular check up. So we took Piper home, put her in isolation and started tracking down and examining all the other cats. After an hour of chasing around the other 7 cats, it appeared that no one had any wounds. The best we can deduce is that Piper passed a blood clot in urine and the two diffused together to look a lot worse than it was. But still, walking into that scene in the kitchen will be an image that sticks with me for a while. My mom took these beautiful pictures of Piper in the sun. Piper did finally get cleared for a dental in December (only about a week before I had my wisdom teeth out, irony anyone?) and she did great. She does have resorption disease and they had to do some extractions. Hopefully, she will not need more in the future, but it is possible. And currently Piper has been isolated in my parents' bedroom since all of these occurences...she hasn't really wanted to leave. Especially because Bobby has been agressive towards her. So we have had some unsettled issues, like anyone with mulitple cats might expect. Piper does tolerate the other cats coming in the room, but she tenses up. We are working to try to get her back out in the general population, but it is taking some time. Thank you to all of our followers for an amazing six years, and here is to more years of blogging! It wouldn't be possible without your support!